Recently I was set a challenge by the lovely people over at Fragrance Direct. 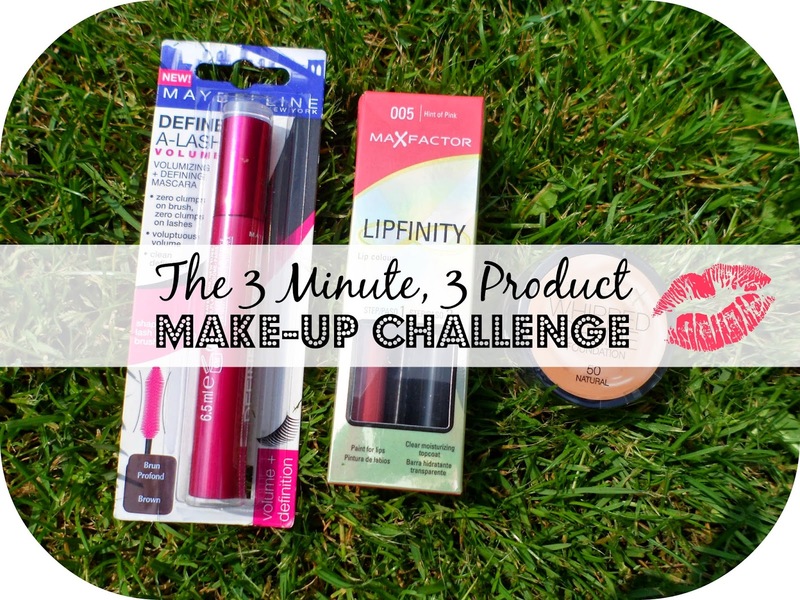 A 3 minute make-up challenge. Now being a girl who has worn make-up for over 10 years now and who has her morning routine down, I thought this would be easy peasy lemon squeezy..... until they told me I could only use THREE PRODUCTS - now that is a challenge! I spend a long time on the fragrance direct site, browsing through and having a good long think at how I could get a good full face of make-up with just 3 products that I could apply in just 3 short minutes.... that's only 180 seconds to go from drab to fab! Minute 1 : I started by dotting some of the foundation under my eyes and blending to try and conceal my dark circles. I then proceeded to apply the whipped creme foundation to the whole of my face and blend in until it was even! Minute 3 : With one minute to go I finished off my eyelashes, I have really short lashes so I normlly spend alot of time trying to lengthen and curl! Once my lashes were done I grabbed the pink lipgloss again and dotted it on my cheeks for a splash of colour, I blended it in and surprising made a great blusher! 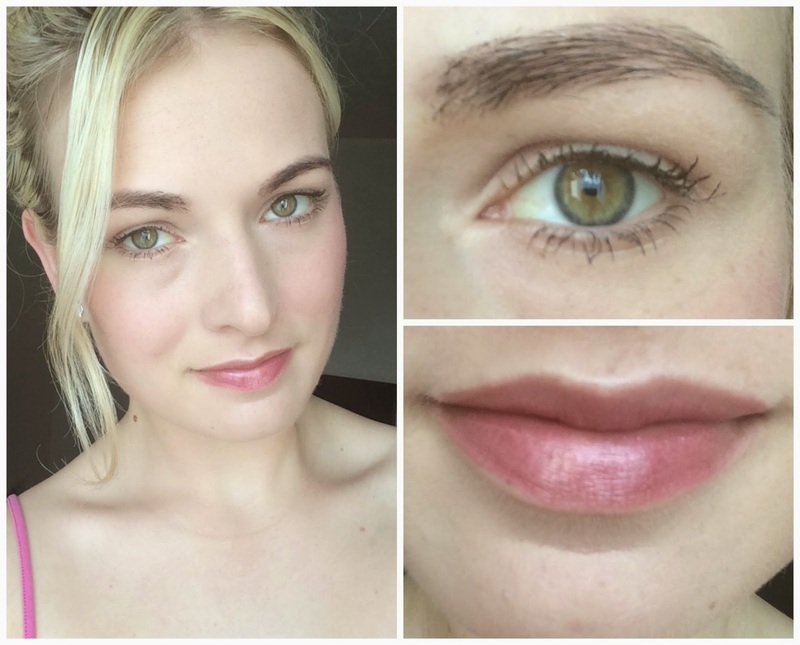 It was then time up - my face was done in just 3 minute with 3 products... what do you think? This has definitely shown me that I don't always need as many products as I normally use (aka alot)! I love using products for multiple uses and I feel like the 3 products I choose actually worked really well together and I managed to complete an acceptable look with just the 3 of them! A huge thank you to Fragrance Direct for challenging me - it was slightly harder than I imagined it but I'm happy with how the end result turned out and proud that I managed to do my make-up with just 3 products.... it's a first!! It turned out great! I wish I was capable of finding and using three items to make a flawless "3-minute masterpiece!" Loved this post, love your blog :) Keep up the great work! You look great no way I could get a good luck in 3 minutes! that turned out really well for a 3 minute look, you wouldn't think looking you that it was 3 minutes! wow the makeup turned out really well thinking of the challenge given! Love your idea of using brown mascara as an eyebrow product - so creative! Ooh wow, you did so well! I could never manage this, and you still look stunning! You look fab! It's definitely inspired me to try and use fewer products day-to-day; with a toddler to look after it would probably help!